For some years now I have wanted to learn how to kite surf. In fact, for a rather long time, come to think about it, ever since first spotting the early uptake as way back as 1998 in Tarifa, on Costa de la Luz. Back then, there were a couple of dudes mucking around with these big flying things, carrying around more paraphernalia and lengths of strings and small surf boards and harnesses and helmets than you could shake a stick at. Oh, how we windsurfers scoffed at them. "Passing fad," I think we even muttered under our breath, silently in awe of the ease of set up and acrobatics being displayed on the waves. "It'll never catch on, it's far too windy here for it to be safe!" we continued, shaking our heads. 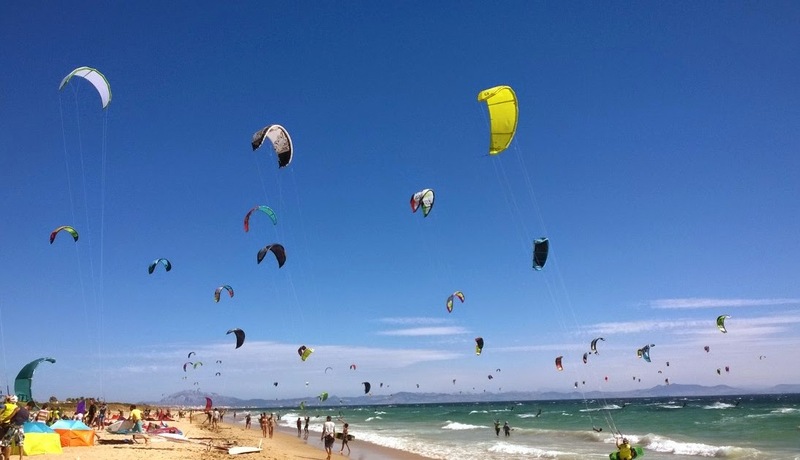 Fast forward sixteen years - yes, we have been returning here that long - and the kites now outnumber the windsurfers. By a ratio of about one hundred to one. So I have taken the plunge. Or rather, OH and I both have (okay, he started last year, but I caught up to his level with a couple of sneaky lessons before he arrived). Stay posted. I might just be able to show some footage at some stage - although logistics are eluding me at present and I have visions of my Nokia Lumia being trashed by sand, sea and wind by one of the well-meaning offspring as they attempt to capture proceedings. In the meantime, I'll leave you with this clip. This girl was so good until I decided to catch her on film.